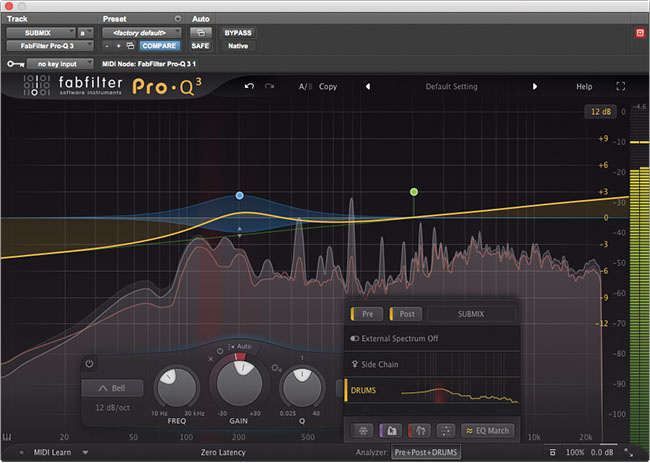 I'm not sure if there is such a thing as a desert island EQ plug-in, but if I was stranded on a Pacific atoll with only one tool to tackle problematic audio files, FabFilter's Pro‑Q would be that tool. It sounds good, it's amazingly flexible, and best of all, its graphical interface makes it a joy to use. 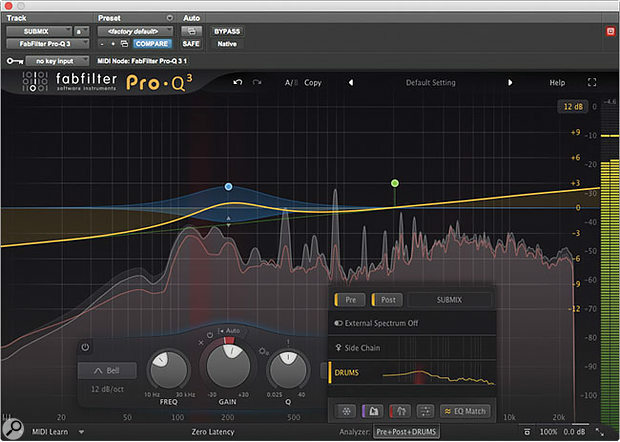 The Pro‑Q user interface has been widely imitated since its debut in 2011, but FabFilter haven't stood still. The v2 update in 2014 added a swathe of new capabilities; the one I use all the time is the 'tilt shelf' curve, which is perfect for transparently rebalancing the tonality of a source or a mix, while other v2 highlights included 'match' EQ, a freely resizable window and greatly improved analysis features. Launched late in 2018, the third major update to Pro‑Q is likewise packed with functionality, and the headline feature this time around is dynamic equalisation. FabFilter fans will, of course, be well aware that the company already make the superb Pro‑MB, which provides versatile frequency-dependent dynamics processing, so the question on many lips was how they would manage to introduce this into Pro‑Q without either duplicating Pro‑MB functionality or creating a pale imitation of it. And FabFilter fans won't be surprised to learn that they have indeed found a way to do this. What you don't get in Pro‑Q 3's dynamic bands is much control over the actual dynamics parameters. Attack, release and ratio are fully automatic, as is the threshold by default, though this can be switched to manual control. In use, though, this really isn't an issue, because the automated settings respond very intelligently to any input signal you throw at them, and you can easily set a limit to the amount of gain boost or attenuation that gets applied; the 'direction' of the dynamic action is also easily controllable, so you can have a boost that attenuates dynamically or vice versa. What you do get here that isn't on offer in Pro‑MB is the ability to create very narrow dynamic bands, allowing you to dynamically dip out resonances, feedback whines and so on. Both plug-ins handle straightforward duties such as taming proximity effect on a close-miked vocal with aplomb; for more advanced work, and especially for controlling the tonality of complex signals such as a full mix, it is definitely worth investing in Pro‑MB too! There have also been further improvements to the analysis features. Previously, functions such as EQ matching relied on the user setting up side-chain routing, but now, instances of Pro‑Q can communicate directly. In the pop-up control panel for the spectrum analyser, you'll see a list of all the other instances in your project. Selecting one will display the signal it's seeing overlaid with that of the open instance. This makes it so much easier to set up EQ matching, and also enables a new feature called Show Collisions, which warns you when two sources might be fighting for the same bit of spectral real estate. Other new features include a 'brick wall' filter slope and the neat 'flat tilt' shape, which simply rotates the entire frequency spectrum about a fixed point, applying more and more boost or cut the further you get from that point. Finally, Pro‑Q 3 now works in all major surround formats, and a drop-down menu for each band allows you to specify exactly which channels that band should affect — in stereo, the choices are left, right, Mid, Sides or both channels. Oh, and it'll even open your presets from Pro‑Q and Pro‑Q 2. I make no apologies for being a FabFilter fan myself, and updates like this are the reason why!